The Bishwa Ijtema Tongi Bangladesh, the world second largest congregation of Muslim Ummah after hajj, will be held at the bank of river Turag in Tongi in two phases, first during January 24-26 and next January 31-February-2. Bangladesh Road Transport Corporation (BRTC) has arranged special bus service for 14 days from January 21 to facilitate pilgrims of the annual events. Officials said some 300 buses will be engaged on payment service to pick up pilgrims from Aricha, Paturiaghat, Mirpur, Narsingdi, Narayanganj, Comilla, Bhairab, Kuti Choumohoni, Brahmanbaria, Kishorganj, Birishiri, Netrokona, Sonapur, Charjabbar, Laxmipur, Kalmakanda, Madan, Monohordi, Mirkadim, Mohonganj, Akhaura, Mymensingh, Saidabad, Gulistan, Gabtoli, Kamlarpur and Joydevpur upto Dhaka. The return bus service of the BRTC from the Ijtema site will start on January 28 and February 3. 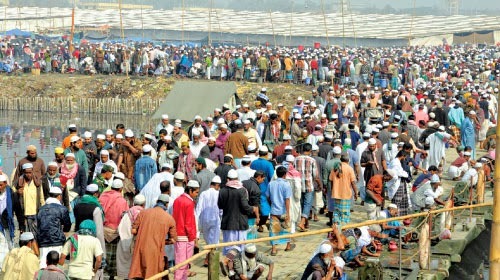 The officials said a control room of BRTC will also be set up at the BRTC Joharsahara depot to manage the traffic for the Biswa Ijtema premises. According to the BRTC, a double-decker bus service will also be available from Kakrail Mosque to drop the pilgrims to the Ijtema spot. Another special bus service with the sticker reserved will also be running to carry the foreign delegates to the Ijtema premised. Communications Minister Obaidul Quader on Saturday visited the Biswa Ijtema site to see the work to 1.2 kilometre pavement and road by himself. The Tk 20 million work is expected to be completed on January 20. The minister after the completion of the road and pavement work, the pilgrims will be able to reach the Ijtema spot without trouble.